Floh Club is a "telephone-based technical support service"
(CNN) -- She's been called "America's mom." Strangers stop her for hugs in the airport. And she still dishes up kindly parental wisdom daily in reruns of "The Brady Bunch." 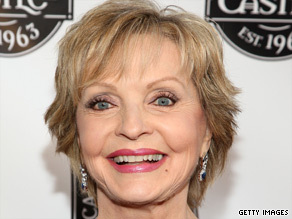 "Brady Bunch" actress Florence Henderson founded a service to help older adults learn about computers. Now, actress Florence Henderson, otherwise known as Mrs. Brady, has a new mission: Helping older adults learn to use technology. Her new business, Floh Club, is a "telephone-based technical support service" focusing on people who didn't grow up with computers -- especially grandparents who want to stay in touch with family but are intimidated by webcams, Facebook, instant messaging or even e-mail. Henderson says Floh Club is "like roadside assistance for your computer." CNN: What made you think of this? Florence Henderson: I was terrified of computers, Josh. I didn't grow up with them. And I have four kids, and they were always saying, "Oh, Mom, please get connected." And I would go, "No, I don't have time." But I was really scared. And so, a few months ago I decided that if I felt that way, there must be a lot of older adults that feel the same way, or maybe even some younger ones. I am now sending e-mails, I'm videoconferencing. I'm taking photos off my camera and actually putting them on the computer. Facebook, it is so exciting. I mean, I'm thrilled. CNN: What kinds of calls are you getting? What have people been calling and saying they need help with? Henderson: Things like as simple as learning how to send an e-mail. We have all North American-based technical experts standing by. Eighteen hours a day. Seven days a week. They are all very patient and very caring, and they will access your computer remotely, and they will talk you through any problem you may be having. They'll teach you how to use your computer. CNN: The plans and services range from $25 to up to $250 for an entire year. You have grandkids. Do you stay in touch with them this way? Henderson: You know what, Josh? That's one of the most exciting things for me is to be able to videoconference because I have a son and his wife and two children that live in St. Louis. I have a daughter in Florida. And they have two children. And now I can actually see them. I have a new granddaughter who is just a year old. I can watch her grow, and I can talk to them. To me, that is the most exciting thing. And so I'm encouraging older adults to really stay connected and use your brain. CNN: It's the 40th anniversary of the Brady Bunch. We see sitcom stars come and go. But you, 35 years after the show technically ended, you have stayed out there as an icon. What's your secret? What did you do that no one else figured out? Henderson: You know what, Josh? I think it's because I love what I do. I'm passionate about what I do. I've always kind of felt that my career was my vocation, and I love staying on top of things. Now I'm cybermom! I genuinely love to communicate. And I love people. CNN: I got to tell you, when I said I was going to talk to you today, every person I talked to said I have to get the truth about you and Greg (Barry Williams). You write about this on your blog. Just give everyone the real story. Henderson: The real story is that he always had a crush on me and he asked me to go on a date with him. And so I went. And he only had a driver's permit. And his brother had to bring him to my hotel, and then he could drive my car, you know, he had a permit. But it was so sweet and so innocent. And he's still a very dear friend.